A recent decision of the Supreme Court has ruled for the first time that pre-nuptial agreements are lawful in the UK. The couple in question were a German heiress and her banker husband. They signed a pre-nuptial agreement in 1998. The wife to be said at the time that it was: ‘a way of proving the fact that he was marrying her for love’ and not for money. This agreement was signed in Germany but when the marriage came to an end in 2006 and the couple separated. The husband, who by that time had left the banking world and had become a mature student, decided to challenge the pre-nuptial agreement. His lawyers argued that it had no validity in British law because it had been signed in Germany, and had no status in English law. The Supreme Court made history when it decided that the prenuptial agreement should be a deciding factor in divorce cases in England. In the instant case, this meant that the ex-husband had to be content with his earlier divorce settlement of £1m and the use of a £2.5m property until his younger daughter reaches the age of 22. The ex-wife is thought to be worth more than £100m, which has largely been inherited from her family who had a paper business. Pre-nuptial agreements are valid in both the United States and in Europe. Until this judgment they had little force in England. Before this case, family court judges relied on the premise that marital assets (money and property accumulated during the marriage) should be divided equally between the divorcing parties. This judgment is particularly important for people who may have received settlements from previous marriages but who want to remarry. People in the UK are increasingly divorcing and marrying for a second time. Often, there are children from previous marriages to consider, and the value of assets accumulated from previous relationships must be evaluated and protected. 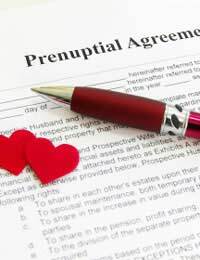 Prenuptial agreements now mean that you can effectively protect your assets in the event that your marriage breaks down. Critics of the new precedent have said that this means now that it will often be the wealthier spouse who will benefit, and leave the less well off individual substantially worse off. Often this will be the woman. Because this case was decided in the highest UK court in the land, this now means that a prenuptial agreement can be the deciding factor for couples if they divorce. Previously a pre-nuptial agreement could be a factor taken into consideration in the divorce courts, but it could be disregarded depending on the other circumstances of the case. Now, as long as the pre-nuptial agreement is valid, legally binding, and was not signed under duress, it can be the decisive factor in a divorce settlement. In other words, the division of assets in the pre-nuptial agreement can be the only thing the divorce court considers in the event of a contested divorce. If you are considering remarrying again, you should think about the assets and property you hold in your own name and what you stand to lose if the marriage fails. This is particularly important if you have dependent children from your previous marriage. If in any doubt, you should contact a specialist family lawyer.